Training in Holistic Pulsing is available through training organisations who offer NZQA accredited courses. Individual teachers also offer short introductory workshops or tasters – please enquire. Training Pathways: whether you are new to body work, or an experienced practitioner, you can start with an NZQA level 5, 30 hour training, which will give you the skills to either give relaxing sessions, or add to your existing skill set. If you chose to go further, you can progress to Intermediate and Advanced trainings – it’s your choice. Training in Holistic Pulsing is available through New Zealand training organisations who offer NZQA accredited courses. Wellpark College in Auckland also offers Holistic Pulsing Training (HP unit taught as part of massage Diploma). International schools offering Holistic Pulsing training are based in Australia, Holland, Israel and other countries. see our LINKS page for further information. NZQA Level 5, 40 credits (400 hours). A 2-year, part-time practitioner course in the gentle mind-body healing method of Holistic Pulsing. 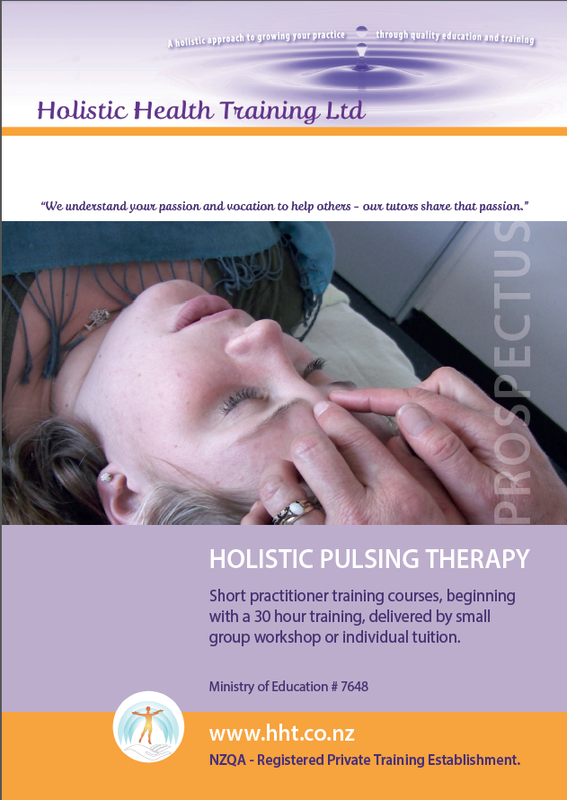 Visit www.hht.co.nz for a Holistic Pulsing Prospectus. Faculties for Massage (HP unit taught as part of massage Diploma), Aromatherapy, Herbal Medicine, Nutrition, Yoga, Ayurveda, Naturopathy. “The HP Module One was relaxing – so easy to learn! “ ST, 2017 HP Module One training. “The training was in-depth and thought-provoking, and integrated nicely with my existing skills. I can use the learning, straight away in my massage practice.” AG, 2016 HP Module Two training.